ELAC Vela BS 407.2 is the floorstanding alternative to the 403.2 bookshelf model featuring the same trapezoid shape, JET tweeter and rear-angled design combined with aluminium and glass. 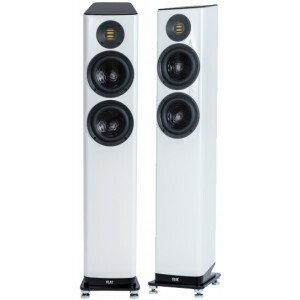 ELAC Vela BS 407.2 Floorstanding Speakers (Pair) incorporate high-class lacquered and wooden veneered cabinets distinguished by the trapezoid shape and rearward angled design. The sound of VELA demonstrates it´s family background to successful series 400. The angling of the cabinet in combination with the new wave-guide of the JET tweeter improves the definition of stereo and multi-channel audio in modern furnishing. Beyond the visible aesthetics, the optimised drivers are able to reproduce high-energy transients more precisely. The convex shaped baffle and the big radius’s of the cabinet promote the acoustics because influences of cabinet to frequency response are reduced. The bottom plate is made of aluminum and is featured with a down-firing bass reflex port which gives advantages in positioning the speaker. Thanks to its flexible connections the Vela series offers the ability to use bi-wiring and bi-amping.